We have tried to make this site as simple as possible, but some of this information might help you. The last day for ordering for guaranteed Christmas delivery will be Wednesday 19th December 2018. Simply browse through our products to find out more about them. From here you can choose to purchase them if you like. If you would like to order some to be delivered to you, you can chose to pay with either PayPal, Credit or Debit card, or cheque. Is it possible to order a mixed case? Yes! So long as the bottles are the same size such as all 500ml, 568ml or all 750ml. All postage and packaging is free! The price you see is what you pay. However, we only offer free delivery to Mainland UK. Please contact us for prices of delivery to other areas of the UK. Not only is your purchase insured through PayPal, but if for any reason you are unhappy with your order, you can return it to us within 7 days for a full refund. Orders are usually delivered within 48 hours of leaving the farm, however the courier does not pick up on weekends or Bank Holidays, so, for instance an order placed on Friday afternoon will be picked up on Monday from the farm and usually delivered by Wednesday. Collection from us can be as early as 1100 am so if your order is later than that it will go out the next day. How long will my cider or perry last? Bottles have at least 12 months Best Before Date from leaving the farm. Bag in Boxes, if kept cool, will be good for at least 3 months unopened or once opened, one month. What are Bag in Box ciders? Most of our ciders and perries are available in 10 and 20 litre Bag in Boxes. The 10 litre holds 17 and a half pints and the 20 litre holds 35 pints. 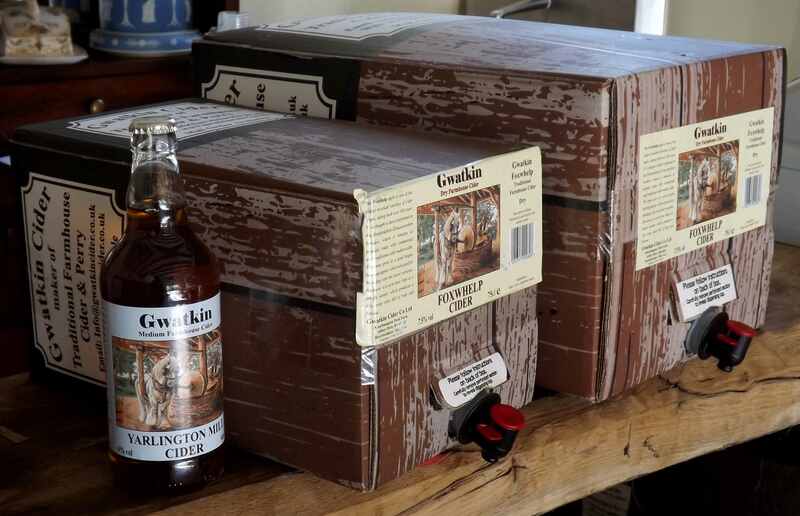 The boxes contain a plastic bag with integral tap, the bag collapses in on itself when the cider is drawn out, minimising the surface area of the cider coming into contact with the air and oxidising. The 10 ltr Bag in Box fits in a standard refrigerator without the need to move shelves around. For pubs the integral tap can be connected to a handpump or beer engine via a connector, allowing the cider to be served from a pub cellar to a bar. Pumpclips can be supplied to the trade on request. The cider I bought from you is cloudy, is it safe to drink? Yes! The cloudiness is caused by natural yeast from the fermentation of the sugars in the juice and will do you no harm. Are your ciders and perries suitable for vegetarians? Yes, all our ciders and perries are suitable for vegetarians and vegans as no animal products are used in their production. Cider and perry, being wheat and hence gluten-free are also suitable for coeliacs. Perry is fermented pear juice. Does your cider and perry contain any allergens? All our ciders and perries are gluten-free and vegetarian/vegan friendly. No celery, cereals, crustaceans, eggs, fish, lupins, milk, molluscs, nuts, mustard, peanuts, sesame seeds or soya are used in our ciders and perries. Our 500ml bottles may contain traces of sulphites as these are used to clean the lines at the bottling facility and a trace MAY be present in the bottles.